Recently so many web owners have faced the long arm of the law. They paid huge fines after their website underwent scrutiny and were found not to be ADA website compliant. Make sure that your website conforms to the WCAG 2.0 guidelines of the section 508. Section 508 compliance is extremely important! Contact us for a free consultation today. We review all commercial and governmental properties for disability accessbility issues and DSA oversight. Hiring and competent firm is the first priority any new or existing property owner should consider. Mitigating any risk associated with disability access lawsuits should remain a priority until reviewed by a CASp Inspection company. We provide you constructive counsel, clear processes and ongoing communication. We specialize in: DSA on-site, long inspections, access assessments, with clear plan for transitions. Our consultants are licensed and certified construction professionals who will understand the complexity of your project early and will counsel your team in advance of any challenges. WHAT IS WEBSITE ADA COMPLIANCE AND IS YOUR SITE ADA COMPLIANT? We run into ADA issues quite often these days whether we walk into buildings that do not enable ramps for the handicapped, or businesses that do not have wheelchair-friendly restroom stalls, or websites with color contrast issues and no alternate text on images. As a result, the Americans with Disabilities Act, or ADA, was signed into law on July 26, 1990 by George W. Bush. It is a civil rights law that prohibits discrimination against individuals with all types of disabilities by employers. Technology forces us to think about accessibility in a broader context than even our physical environment. It’s not just whether a person requires a wheelchair. A person could be visually impaired or have a motor disability. A person could have slower internet or an older browser. With a graying population, some are not familiar with modern user interface (UI) pattern. Disabilities may include visual, auditory, physical, speech, mental and neurological disabilities. Adherence to web accessibility standards not only benefits the handicapped but all users. Website ADA compliance includes guidelines that take into consideration the needs of people with disabilities so they can navigate your site and get the information they need. Accessibility guidelines for websites are complex and subjective – The design rules are technical. It’s code! Most businesses are not tech companies! Accessibility can’t be automatically fixed – There’s no plugin or program to add accessibility to your website. Features have to be repaired or rebuilt altogether. Automated tests aren’t complete – A computer will find a list of unimportant errors in its design of almost any site. At the same time, this computer won’t find or understand the real roadblocks that users confront on the site. For your website to be considered ADA web compliant, there are 12 guidelines that were listed in the Web Content Accessibility Guidelines, otherwise known as WCAG 2.0. They are standards for web accessibility and guidance on conformance. The success criteria are written as testable statements that are not technology-specific and are categorized into three levels of compliance: A (basic or minimal impact), AA (mid-level or “happy medium”), and AAA (advanced). Some of the guidelines for website ADA compliance are mentioned below. Contact us for Section 508 remediation. There are specific rules applied to color contrast and font size when it comes to ADA web compliance. This is to enable people with low vision to conceive the information without experiencing problems. One of the key guidelines of website ADA compliance: Your website should be fully accessible with the use of a keyboard. This makes anyone using the website to be able to navigate through pages without using a mouse or any other input device. There should be navigation controls to allow users to skip to the bottom of the page, go up, move right or left without necessarily scrolling, depending on the level of ADA web compliance you are trying to achieve for your site. The website should not contain flashy images or content making it unsuitable to those people with photosensitive epilepsy. This is known to trigger seizures. If you have videos and images on your website, you should create alternate tags or captions for such content. This will allow screen readers to read the content. Seems small, but this is a big one when it comes to ADA web compliance! One of the main goals of ADA is to provide people with disabilities the opportunity to participate in the typical American life which includes enjoying opportunities, purchasing goods and services in person or online via a website, and participating in government programs and services. The ADA standards are developed and managed by the Access Board and both the Department of Justice and the Department of Transportation are responsible for enforcing the standards. WHAT IS ADA WEB ACCESSIBILITY COMPLIANCE? Technology forces us to think about accessibility in a broader context than even our physical environment. It’s not just whether a person requires a wheelchair. A person could be visually impaired or have a motor disability. A person could have slower internet or an older browser. With a graying population, some are not familiar with modern user interface (UI) pattern. Disabilities may include visual, auditory, physical, speech, mental and neurological disabilities. Adherence to web accessibility standards benefits all users especially the elderly. Accessibility laws have increasingly expanded to an online context. Websites must support assistive technology such as screen reader programs, which read aloud webpages to help the visually impaired. The Web Content Accessibility Guidelines, otherwise known as WCAG 2.0, are standards for web accessibility and guidance on conformance. While the question of what activities online must be made accessible is unsettled, accessibility laws have focused on WCAG 2.0 as the standard for digital accessibility compliance. It is in vein of Section 508 and Section 504. It covers a wide range of recommendations for making web content more accessible. The success criteria are written as testable statements that are not technology-specific and are categorized into three levels of compliance: A (basic or minimal impact), AA (mid-level or “happy medium”), and AAA (advanced). WCAG 2.0 was produced by the Web Accessibility Initiative, part of W3C–the group of developers who establish a lot of the mechanics of the modern internet. WHAT IS USABILITY TESTING AND HOW IS IT RELATED TO ACCESSIBILITY TESTING AND ASSISTIVE TECHNOLOGIES? Usability testing is a technique used to evaluate a product by testing it on potential users. Accessibility testing is a subset of usability testing. It is used to determine whether the product will be able to be used by individuals with disabilities whether with the help of automated accessibility testing software or sample workflow audits performed by web engineers or blind individuals. Individuals with visual disabilities use assistive technologies like screen reader programs to help them read the text that is displayed on the screen. An assistive technologies are equipment or system used to increase, maintain, or improve the functional capabilities of individuals with disabilities. These types of assistive technologies are generally always used during usability testing. DOES ADA APPLY TO MY BUSINESS AND WHY SHOULD I CARE? Absolutely. The Department of Justice issued an Advanced Notice of Proposed Rulemaking in 2010 to ensure that ADA applies to all business with more than 15 employees and its respective websites public and private. Just as your brick-and-mortar business must be accessible to all customers, the same goes for your website. Each year ADA compliance litigations filed by advocacy groups and law firms across the U.S. are on a significant rise, and your company is also at risk of possible lawsuits. Taking a closer look into section 508, it not only wraps around website content. It goes beyond just a mere website. The department of justice was too keen to make sure that it involved a wider part of digital communication. These include emails, PDF, gaming software, mobile apps and any other form of digital information that persons with disabilities interact within their day to day lives. Even though a wide variety of particulars are covered, more emphasis has been based on website content. What has made website ADA compliance act seem very hard to website owners is that they are taking it as a task and not an opportunity. Having your website meet section 508 compliance means that anyone can access your website. You get to increase your traffic and coverage alike. Many people are seeing it as a way of limiting them and tying them down to some specific rules that don’t make sense. The department of Justice is trying to make websites accessible to everyone and not just specific groups of people. Online accessibility standards are complex and at times, subjective. Many companies are not aware that their sites are required to be ADA site compliant. Unfortunately, many businesses have learned of this requirement via contact by an advocacy group or law firm for remediation. Be Accessible, Inc. will provide your company a low cost website and mobile application audit that will bring your business towards website ADA compliance. With our 3-Step Solution, we’ll first utilize top rated automated software to log the location of distinct errors on your site. Next, our experienced web auditors will manually inspect a representative sample of your website or app to identify greatest accessibility issues. Lastly, we’ll bring blind individuals into a lab and conduct usability testing of your website or mobile app. We aim to repair your site with a little effect on your development team as possible. We’ll work closely to train how to integrate accessibility into your online processes. 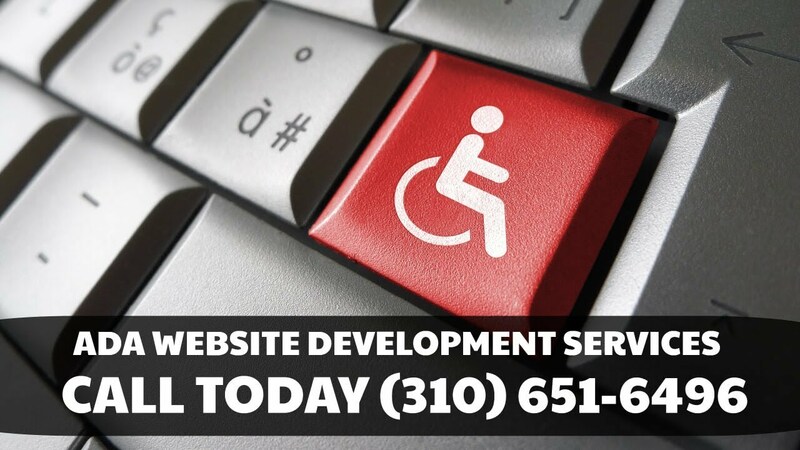 We also can provide on-site ADA training for your business in order to spread awareness about disabilities in the workplace and teach you how to eliminate accessibility issues. We reduce your legal risk, bring you to website ADA compliance, and broaden the circle that can fully benefit from your site.